Playbill for the Bower Saloon. September 1854. The Bower Saloon was situated in Stangate Street, Lambeth. It was known for its melodramas as well as its unruly audiences. Graphic scenes of crime and violence in plays such as Margaret Catchpole and Maria Marden, or the Murder in the Red Barn were very popular. 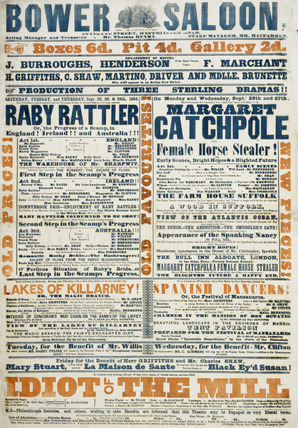 The playbill reveals the way such a theatre promoted its nightly programmes of sensational drama.